Due to popular demand this fascinating book by Patrick Ellis & David Shepherd has been re-printed. 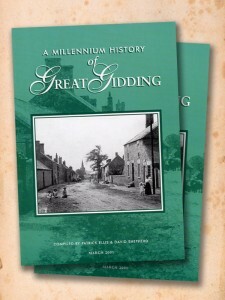 Full of wonderful photos and facts of how the Giddings once were, the book contains 40 colour and 20 black/white modern photos and 80 black/white historical photos, plus 7 maps. A must for anyone living in and around the Giddings, for those who used to know the area or a delightful present to send to relatives living at a distance. Little Gidding” by Michael Wickes dated 1978.